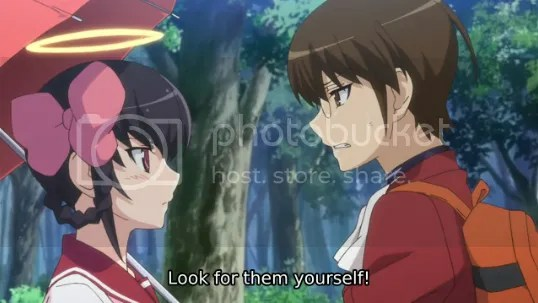 As Keima goes to school, he meets with Diana, who is Tenri’s goddess. 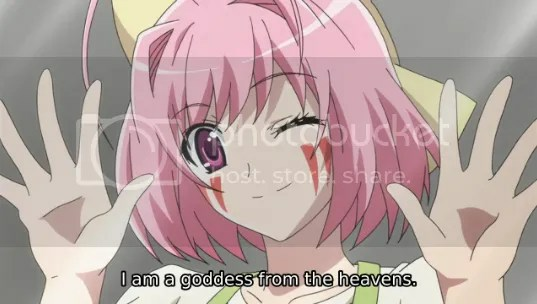 She explains to Keima that she’s a goddess and was one of the ones who helped seal the evil devils and loose souls in hell. However, now that the loose souls are free once again, she’ll need the help of her sisters to re-seal them. Altogether, they make the Jupiter Sisters. 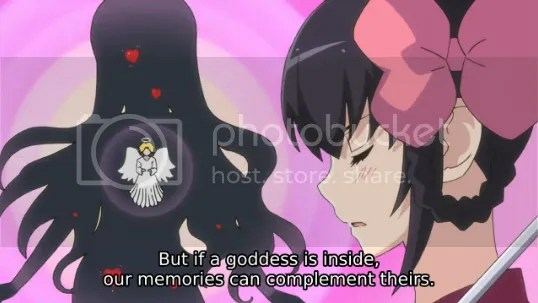 They take their power from love, which is why Diana is so set on Keima showing affection to her host, Tenri. She forces the task of finding her sisters on Keima, though he’s reluctant to take on another quest on top of his conquering one for Elsie. However, Diana mentions that some of his conquered girls might host goddesses, and that they’ll retain their memory if they do. 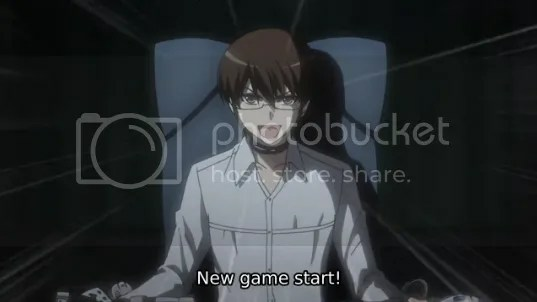 This news greatly worries Keima. Do you like the look of this girl? 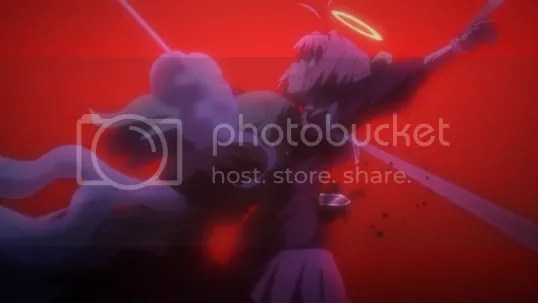 Too bad you will never see her arc fully animated! This is Diana, who made her big debut in the OVAs. So if you never knew the OVAs existed, then TOUGH LUCK! The gist of all this is: Keima is basically screwed. Meanwhile, the teen idol Kanon has been having some troubles too. She’s found herself to be the host for the goddess Apollo. She’s also found herself being stalked by a mysterious cloaked figure, and to have strange memories of the time she spent with Keima. On the same day that Keima has his talk with Diana; Kanon comes to school to take some tests. However, she once again sees the cloaked figure in the corner of her eye, and runs to Keima in fright. 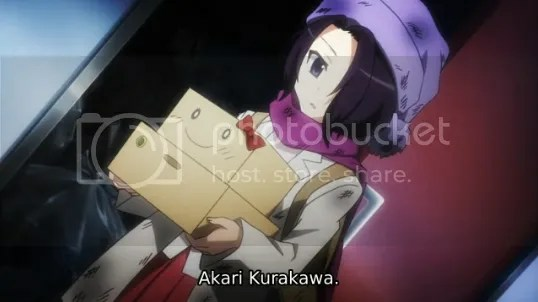 She tells him that she remembers him, and this confirms Keima’s worst fears. Apollo is way more endearing than Kanon is, at least. Okay, as much as I dislike Kanon, I still felt really bad for her when this happened. I’m not going to lie; I have never been so pissed at the TWGOK anime UNTIL NOW. Way to go, TWGOK anime. You skipped like eight girls and essentially made the first episode of season 3 one boring exposition episode. The girls’ arcs that were skipped were some of the best ones, imo. And they chose to skip it just so they can catch up to the manga. Or show more Kanon or something, since the anime producers just can’t seem to get enough of Kanon; what with her having her own special OVA and all recently. Look, I can understand wanting to animate just the most popular arc of the TWGOK manga, but… by skipping those girls’ arcs, they’re only making things harder for themselves. Just look at this episode alone and you can see how bad the pacing was because of all the jumps they were forced to do in order to fully explain things. There’s so many things skipped over from the manga and OVAs that it feels like the TWGOK is giving the middle finger to both TWGOK fans and people who ONLY watch the TWGOK anime. It feels like they’re saying “go read the manga ‘cause we can’t be assed to animate any more than we have to.” And it’s just really sad and infuriating. As much as I love TWGOK, the anime hasn’t really been that great. And season 3 shows that it may just be getting worse in terms of writing/directing quality. At this point, I’m so angry that I don’t know if I even want to do a full episode review for this season. But… we’ll see. Even though I’m starting to hate the TWGOK anime, there were some good things about this episode, like the awesome OP sequence. And the animation at least seems really high-end so far. Hopefully the next few episodes aren’t as terrible as this one, since they’ve gotten most of the exposition out of the way. I’ll definitely still watch and keep up with the TWGOK anime, but if it continues to be terrible then I can’t be bothered putting out reviews for it. Personally, I love TWGOK anime. And while I can understand your hate for this new season, I don’t agree with it. Manglobe came out with a statement a while back saying that they were wanting to focus on the plot because the last 2 seasons haven’t gotten enough revenue to justify its continued existence. So they decided that by skipping to the plot, they might be able to attract more viewership. Do I think it will work? Probably not. People who would only care about the plot wont be interested in sitting through the previous 2 seasons of the show just to get to it. But at the same time, if they just continued on doing what they had been, there was no chance of anything changing. But if you want a different outcome, you can’t keep doing the same thing over and over again. Trust me, no one is more disappointed that we didn’t get an animated Yui arc then I am, but I have to admit that most of the episodes they skipped didn’t really add anything to the plot; and since thats what Manglobe wants to focus on, they were cut. So a middle finger to fans? Not in my opinion. The fact that Manglobe wanted to give it a third chance to succeed I think proves that much. But will the rest of it be any good? That remains to be seen. I suppose I may have over-reacted, and I did realize the possible reasons why Manglobe chose to go this route (like you said in your comments). I still can’t help feeling extremely disappointed, though. I still love the TWGOK series, so I’ll still watch this season for sure. It just makes me sad that the other arcs were skipped over because it was believed that they wouldn’t sell well. I feel like the TWGOK anime may have dragged on some arcs for too long in the first and second seasons. I don’t like things being rushed either, but maybe if they had shortened each girls’ arc to just two episodes, there wouldn’t be this problem.